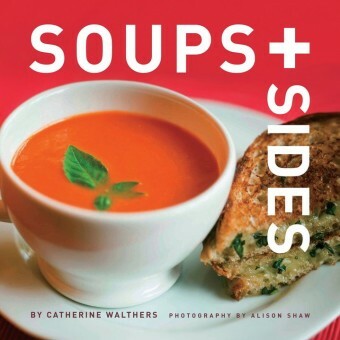 Walthers offers inventive soup and side pairings, creating nourishing meals to be enjoyed in any season. Take comfort in classic duos such as tomato soup with a grilled cheese sandwich or dive into new favorites including Thai carrot soup with watercress spring rolls and red lentil soup with chickpea burgers. Soups and side dishes may take a backseat in most cookbooks, but Walthers gives them top shelf in her kitchen. A variety of side dishes–salads, sandwiches, and heartier fare such as quesadillas and twice-baked potatoes–are paired to not only complement soup but “elevate” the humble dish. A comprehensive ingredient chapter and section on techniques–including tips for freezing stocks, simmering soups, and blending–precede the collection of recipes. Each soup (divided primarily by protein), is paired with a side dish; they include globally inspired dishes such as Thai carrot soup with a side of wild watercress spring rolls; Greek-style chicken and orzo soup alongside fattoush salad with chickpeas and feta; Italian wedding soup with kale and mini meatballs served with garlic bread; and Portuguese white bean and greens stew alongside Portuguese tapas. The recipes are culled from restaurant owners as well as the author’s culinary circle of friends and caterers, yet all dishes are manageable for the home cook. As a follow-up to her wildly popular cookbook, Raising the Salad Bar, has just produced an amazing collection of fresh soups—each paired with a fun side dish—for her new book Soups + Sides. Both books have the exceptional and vibrant photography of the Vineyard’s own Alison Shaw which makes perfect sense to me, as I think of Cathy’s cooking as vibrant, too—ultra-fresh and unfussy, full of flavor without unnecessary embellishments. Even in the extremely good company we have here on the Vineyard, I think Cathy is one of the best cooks around.